The nest box trap is a device that is placed in a birdhouse or Nest Box. It is used to trap two species of introduced cavity nesting birds: the house sparrow and the European starling. Both species compete aggressively with our native Cavity Nesters, like bluebirds, chickadees, and woodpeckers. They are relentless in their defense of a nest box they have chosen as their own. Left alone, they will force native birds from nest boxes, kill the adults and young, and destroy the eggs. If either of these species are trying to nest in your nest boxes, the only real solution is trapping them. House Sparrow Control explains methods of trapping sparrows. European Starling Control explains methods of trapping starlings. Until I started trapping house sparrows, I rarely had success with bluebirds nesting in my yard. Since I started trapping, I've had bluebirds nest multiple times in one year. There are other nest box traps on the market, but from reviews I've read, the Van Ert trap surpasses them all in ease of use and efficiency at catching house sparrows and starlings. The Van Ert Traps work for both starlings and house sparrows. 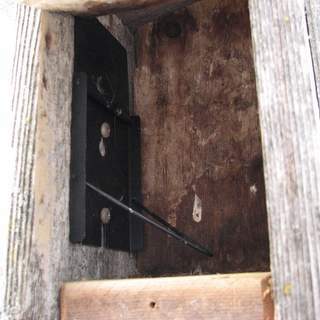 The trap slides over two screws that are located on the inside front of the nest box. When the trap is not in use the screws remain, allowing quick placement and setting of the trap. 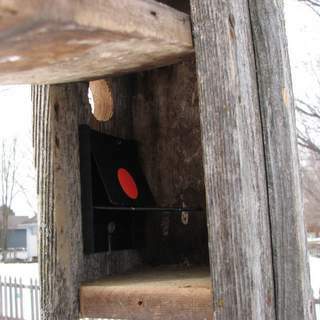 The trap is inserted into a birdhouse that is being visited by house sparrows or starlings. When the bird enters the house and lands on the trigger, the trap door is released. This in turn covers the entrance of the nest box, trapping the bird inside. 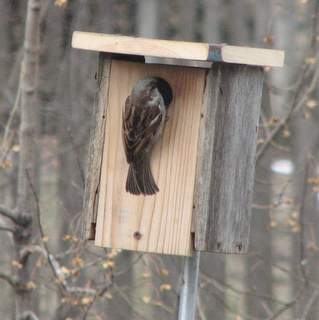 The Universal Sparrow Trap can be used on nest boxes with a hole diameter of 2 inches or less. The Kestrel Starling Trap can be used on nest boxes with a hole diameter of 2 to 3 inches. When you notice starlings or house sparrows visiting your bird houses place the nest box trap inside the house and set the trap. When the bird enters the house, the Van Ert trap will trip and cover the hole, trapping the bird inside. The bird is captured alive and unharmed. 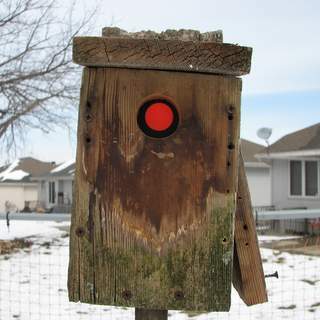 When the trap door covers the hole, an orange dot or dots show at the nest box hole signaling that a bird has been caught. This makes it easy to determine when the nest box trap has been sprung. Once the bird is captured in the box it should be removed immediately. If a native bird is caught, it can be released unharmed. If a house sparrow or European starling is caught, the bird can be killed. Only use the traps when you are present and can monitor them. Remove the trap from the house when you cannot monitor it. If you leave a trap unmonitored and forget about it, a native bird could be caught and die. Depending on the species you are trying to trap, you should have at least two houses that can be entered by that species. This allows you to continually trap the non-native pest birds while the other house is being used by a native bird pair. The unused box acts as a decoy box. If you only have one nest box, the house sparrow/starling may attempt to usurp the house from the native birds. They will also destroy nests and eggs; and even attack and kill the nestlings and the adults. Once you see that a trap has been sprung, you know you have caught a bird. Follow these steps to remove the trapped bird from a nest box trap. Loosen the screw or fastener that keeps the nest box closed. Do not open the box. This is done to allow you to easily open the nest box once it is covered. Place a clear plastic bag or mesh laundry bag over the nest box. The bag should be clear or made of mesh to allow light through. The object is to entice the trapped bird to fly out of the box and into the bag. Because the bird sees light it will try to escape and fly into the bag. Secure the bag at the bottom around the nest box. A twist tie can be used, to allow both your hands to be free; or hold the bag around the base of the box with one hand. If you don't secure the bottom of the bag, the bird may escape. With the bag over the nest box and secured at the bottom, open the nest box. The bird will see light and fly into the bag. Use your free hand to grab the bird. The bird will flutter around in the bag until you can securely grab it. A quick motion aids in capturing the bird in your hand. Determine the species of bird caught. If the bird is a house sparrow or a starling it should be humanely killed. If it is anything else, release the bird unharmed. On occasion I have caught native birds in the nest box traps. The most common bird that seems to get caught is the bluebird. One time, I caught a female bluebird four times in two days. Being caught didn't seem to bother her at all, as she kept getting caught. If you watch your set trap continually, you may even see a native bird enter it and get caught. In those cases, just open up the nest box and let them fly to freedom. I've caught a down woodpecker a couple of times and a carolina wren once. Once you have caught a house sparrow or a starling, the bird must be eliminated from the population by humanely killing it. This may sound harsh but remember, these birds are not native and not part of our natural ecosystem. They are an invasive species. They compete with our native birds, killing the adults, nestlings, and destroying their eggs. Releasing the sparrow or starling is not a solution. Do not release it somewhere else. This doesn't solve the problem but moves the problem it to a different location. Euthanizing Sparrows & Starlings explains various humane methods for killing these birds.